"...Turbulence in workflow arises wherever there is an ineffective process hand-off from one worker to another -- adding tremendous costs to the organization. Reducing these costs presents probably the largest single ROI opportunity for companies that have not reached a state of workforce and document automation." - James Lord, President and CTO, QBOS Inc.
QBOS business processes become strategic assets that are a source of differentiation and value to customers and shareholders alike. QBOS partners are empowered and become Business Process as a Service (BPaaS) providers in addition to their fundamental core business line. Encapsulate and offer all or part of a business model. 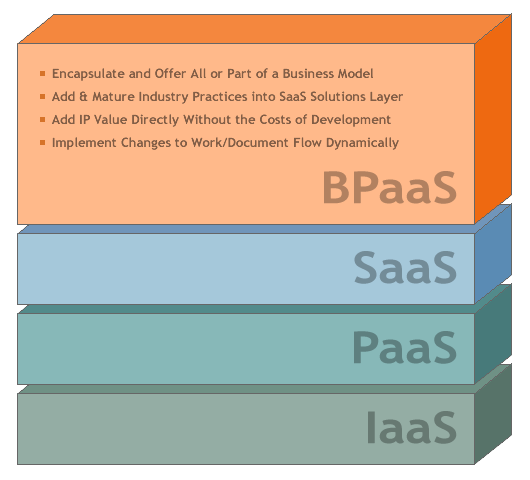 Add and mature industry practices into the SaaS solutions layer. Add IP value directly without the costs of development. Implement changes to work/document flow dynamically. Whether operating locally, federally or globally, business can no longer afford the significant costs of inefficiency created by turbulence within business processes. By providing the BPaaS layer, QBOS enables partners and clients to continue to mature their business processes without heavy reinvestment into the underlying foundations. Business processes and automations become fully integrated throughout the organization, seamlessly functioning across corporate boundaries.